This paper, presented at the International Congress in Manchester on August 31st 2003 shows that, statistically, our way of healing sick houses works: we use dowsing for diagnosing the problem and what to do about it, and then bring in spiritual healing techniques for effecting change. As most dowsers accept, it is very difficult to prove that dowsing is valid for non-physical targets, let alone for healing purposes, and we have moved further into this dilemma by testing the results of work using our method. Our research looked at multiple scores before and after healing, set out in such a way that as much objectivity as possible was achieved, and we outline how this was done in this paper in terms hopefully understandable by non-statisticians. The results were evaluated by a skilled statistician, and you can access her report, including all the complicated statistical expertise that went into it, on our website (1). Many dowsers are aware of different 'energies' at different locations. They sometimes give a characteristic feel to a place. In many cases this 'feel' can affect the mood and health of those living in places where the energies are unhelpful. (Generally referred to as Geopathic Stress.) Commonly, dowsers are asked to check the energy patterns of a house. On finding energies deleterious to the health of the inhabitants, the dowser may recommend moving the bed or favourite chair to a position not influenced by the negativity, or even moving house. Other dowsers seek to block, or divert the energy lines. Some, like ourselves, seek to alter the quality of the energies so that there is compatibility between the energies and those living or working in the building. Our introduction to these matters occurred well over 20 years ago through meeting Bruce MacManaway. We subsequently attended sessions where he taught us to identify these 'earth energies' by dowsing, usually with a pendulum, and to correct the quality of deleterious energies to beneficial by driving iron stakes into the ground at very precisely established positions: "Miss it by a tenth of an inch and you are useless," he said! Having found out how to detect and 'correct' these energies from Bruce, we were surprised to be contacted by people we did not know asking us to work on their houses! So we did as taught, and people felt better. Over the years these requests grew more and more frequent. With Roy still in full time employment and Ann working too, it became more and more difficult for us both to find enough time to visit those requesting help. By this time, we had become Healer Members of the National Federation of Spiritual Healers and were familiar with both 'hands on' and 'distant' spiritual healing. We have been using this remote method for many years and we seldom need to visit places now at all. The numbers of enquiries for this work have steadily increased, almost all by word of mouth. Although we do advertise our dowsing training course (Accessing your Intuition via Dowsing), we do not actively advertise our healing work. Nevertheless we are now responding to about 600 cases a year. We were overloaded in 1998 because of an article in the Sunday Times which elicited 800 enquiries, 600 of them requiring work. This indicated a great interest in these matters, which we find continues to grow. We deliberately cut down our responses for a while in order to concentrate on writing our book (2). Now the interest continues to increase and we know there are many more dowser/healers doing this work, some trained by us. Enquiries are not confined to the UK. We have worked on places in all five continents. The feedback that we get is positive and we receive many letters of grateful thanks. As to payment, this is all on a donation basis. We suggest that people send us something within their means which represents how they value our work. We keep a detailed record for each client. Over the years, these files have come to occupy many archive boxes under the bed in our spare room. In order to get "The Establishment" to accept alternative health processes, there is interest in research work to establish the validity, or otherwise, of various alternative therapies. Thus we thought that the large amount of data within our files might be of use in this context. We thought that we might be able to find a student who could be encouraged to use our data as a basis for a PhD study or similar. However, the various feelers put out to friends at universities did not find a suitable response. Nevertheless, we mentioned these ideas to people on our dowsing courses and Dr Vicky Wass became interested. At that time she was a tutor in statistics in the Business School at Cardiff University. Discussions with Dr Wass quickly revealed that it would be difficult to analyse the data in our files in a way to produce results meaningful to "The Establishment". Any such report would be dismissed as anecdotal and of limited credibility. Therefore she proposed that a properly organised trial be set up and, given her expertise in this area, we had confidence that a scientifically credible assessment of our healing work would be the result. The trial was based on four questionnaires sent out at intervals to 150 respondents. No external funding was sought for this research programme. Dr Wass donated her time in developing the questionnaires, analysing and reporting the results. Ann sent out the questionnaires at appropriate intervals together with stamped addressed envelopes for return directly to Dr Wass. We also conducted the overall administration of the trial and bore the cost of all postage involved. 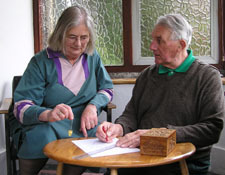 In the early months of 1999, a sample of 150 households, who had requested diagnostic dowsing and healing for adverse symptoms which they believed could be associated with geopathic stress and/or discarnate presences, were invited to take part in a questionnaire survey. Every British resident who requested the service during this period was asked to take part i.e. we only selected out requests from abroad (four in number) because of the complications of return postage. The purpose of this survey was to collect information from which to evaluate the effectiveness of the dowsing and resultant healing work. The survey comprised a series of self-completed questionnaires which were distributed to a member of the household over a period of six to eight weeks during which time each respondent completed four questionnaires in total. The first questionnaire was completed before any dowsing or healing had been undertaken. At Questionnaire Two, the sample was divided into two groups where the first group received treatment but the second did not until later. The healing was done for all respondents before they received Questionnaires Three and Four. Thus a panel of respondents was followed through the course of the work and information was collected about the respondent, the household, the house and the nature and progress of the symptoms which were the basis of the inhabitant's request for assistance. Each respondent was required to score (on a scale of one to five) the general health and well-being of a specified member of the household (the same person throughout the survey) and 26 specific personal and house-related symptoms. Both the frequency and intensity of these 26 specific symptoms were measured. The questions and scales of measurement are shown above. Only one questionnaire is shown. They were all essentially the same except for slight administrative variations reflecting the stage of the survey each time. For many of the responding households there were factors which influence their health and symptoms other than negative earth energies. Since this survey was not conducted under laboratory conditions, and thus in isolation from these factors, we had to find a way of controlling these alternative factors statistically. The approach was two fold. First, detailed information was collected which included information on some of these other factors (for example, use of alternative therapies, effects of medication etc). Secondly, the tests were based on the comparison of averages and the averages were calculated from a sufficiently large number of respondents so that the effects of outlying results (for example a severe deterioration after the healing as a result of chemotherapy) were minimised. The information collected in the questionnaires comprise self-reports of general health and of the intensity and frequency with which 26 specific symptoms were experienced. The same questions were asked in each of the four questionnaires and required a contemporaneous health assessment at each point in time. Thus the respondent was not required to assess any changes in their health over time. The measure of change was generated from each respondent's four contemporaneous assessments. Responses relied upon the subjective assessment of respondents about their symptoms, as opposed to an objective measure (heart rate, blood pressure etc), and were therefore subject to effects of differences in individual expectation and judgment. This element of subjectivity precludes an analysis based upon comparisons between individual people. Consider, for example, two respondents who, in objective terms, suffer equally from the same medical condition and experience a similar level of benefit from healing. The first respondent is rather more stoical with respect to personal pain and suffering than the second respondent and consequently indicates that her general health is 'fair' in the questionnaire before healing. After healing, the respondent is optimistic and enthusiastic about the results and indicates an improvement in her general health to 'very good'. The second respondent on the other hand is of a more anxious and complaining disposition and initially indicates that her general health is 'very poor'. This second respondent records a more modest improvement in her health following healing to 'poor'. Clearly the responses of the two individuals cannot be reliably compared with each other due to the influence of subjectivity. The progress of symptoms for each nominated individual in the household are recorded over time and it is the 'before' and 'after' intervention responses which can be compared. 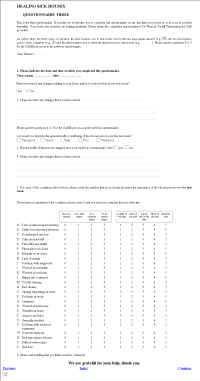 This method controls for the effects of individual subjectivity in the cross section of respondents, with the qualification that the underlying personalities of the respondents remains unchanged throughout the period of the survey, i.e. the stoical respondent remains stoical and vice versa. The measure of effectiveness of the healing is one based upon changes in reported health indicated by individual respondents and is thus relatively independent of difference in their personalities which might affect interpersonal comparisons of responses. In short, by using a panel surveying the same respondents and measuring differences over time rather than differences between respondents, the subjective effects of different personalities are 'fixed' and do not distort the results. 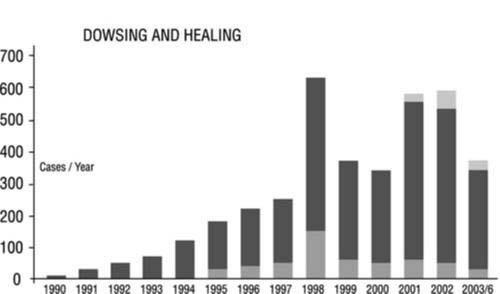 In Part 2, in the next edition of Dowsing Today, we explain how we tackled the thorny problem of the placebo effect, describe the sample, and announce our results. Stay tuned!